Kingsman: The Golden Circle has the umbrella guns, missile-firing cars, and suit-wearing secret agents that you’ve been wanting to see. More surprisingly, the second movie to spring from the Kingsman/The Secret Service comic-book franchise makes a good case for what can be gained in adapting works across different mediums, like a heart beating underneath all that explosive cheesy popcorn. Given that it draws from the reservoir of super-spy fiction, there’s a fair amount of campy self-awareness in the Kingsman pocket universe. The comics—and the first feature film that followed—have had movie stars being kidnapped as part of a big doomsday plot, insane exotic locale fight sequences, and flamboyant archenemies. But the first comics series—written by Mark Millar and co-plotted by Matthew Vaughn, with art by Dave Gibbons, Andy Lanning, and Angus McKie—suffered the same problem as much of Millar’s work. The narrative calculus powering the series feels a little transparent: cheeky celeb endangerment, cranky sociopolitical framing, balls-out violence, and genre staples pumped full of steroids. The source material laughs at itself and invites the audience to do the same. But my experience reading Kingsman comics has mostly felt bloodless, like they could use more heart. I didn’t feel that way at all after seeing a screening of The Golden Circle last night. Don’t get me wrong: the espionage action movie knows what it is, which is not a tearjerker meant to pull at viewers’ heartstrings. Yet, The Golden Circle—which isn’t based on pre-existing material—hits on an earnestness that the comics material never manages. A palpable sense of camaraderie, fellowship, and rivalry throbs across the different spy organizations in the movie. There’s no pretension in the goofy, broad performances of Colin Firth, Halle Berry, Taron Egerton, and Julianne Moore, but they all managed to add another dimension to an idea that started in another medium. We’re in a moment that’s super-saturated with fare adapted from comics, when every project announcement seems to be a cash-grab that invites eyerolls and skepticism. But taking in the new Kingsman movie reminded me why adaptations can be good. Inspired performances and interpretation can add facets to a world you’ve already experienced. As Poppy, Julianne Moore does a great job of being a gleefully unhinged criminal mastermind, but also manages to make her been-done-wrong grievances against the world feel legitimate. Watching Taron Egerton’s Eggsy bumble his way through relationship angst or contain grief and anger reminded me that I didn’t experience the character this way originally. And the loneliness and regret that Colin Firth brings forth in his latest turn as Harry Hart gives a nice counterbalance to the expected unflappable hyper-competence. 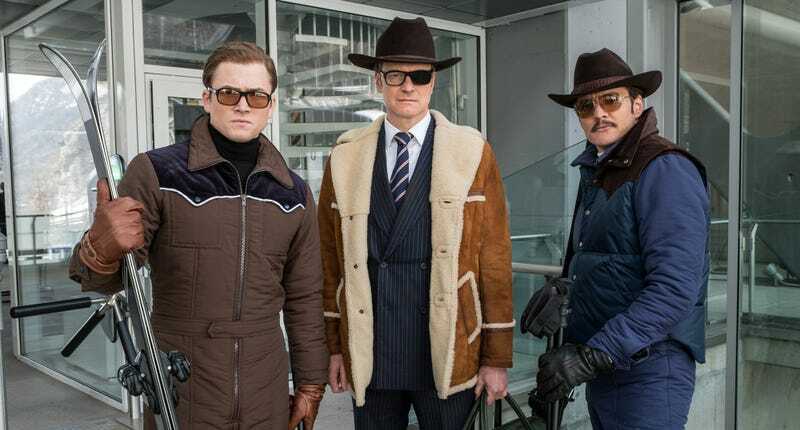 The Kingsman idea feels more fully realized in this other iteration and The Golden Circle feels like it’s filtering the intentional energy of the property, closing the movies-to-comics loop that powered the original series. Over-the-top action comedy is still the order of the day, but the new movie adds a level of heart I hadn’t felt before, and that makes everything more enjoyable.